· Service Activity (see the service chapter). · Campaign Response (see the marketing chapter). · From the new-activity option in the CRM Toolbar. · From the action-add activity menu in the Form menu. · Selecting New when looking at the activities pane for the entity. · Using the follow up button from the form toolbar. · Using the follow up option in the form assistant. · Selecting the workplace-activities pane and adding a new activity. Activities can also be created automatically using workflow when a new opportunity is created for example. Incoming email activities can be created automatically when sent to an email address defined in a queue or when received in response to an email sent out from CRM. 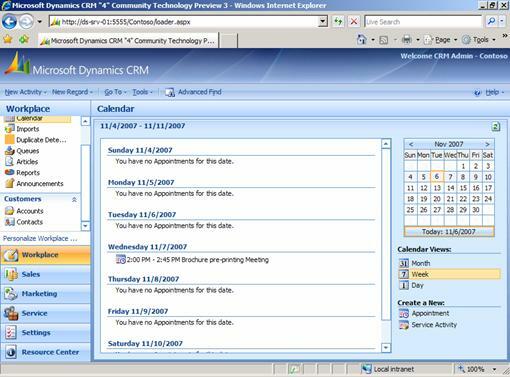 Activities can also be created from the Outlook Client for CRM by pressing the Track in CRM button. Activities can be viewed from the workplace-activities view or from the activities pane against each Entity. Each activity is owned by a user (or a queue) who will undertake responsibility for completion of the task. Note: Take care when creating custom entities as only user-owned entities can have associated activities. · Subject. A short one-line description. · Regarding. The entity record to which the activity relates could be any core CRM entity or user-owned custom entity. · Scheduled Start (the due field). · Category and Sub-Category for your own text categorisations. · Actual Start (automatically filled in on completion). · State. The state of the activity entity, usually open or completed. · Status. A breakdown status relating to each state. Once an activity has been completed it is made available from the history pane against each related entity. 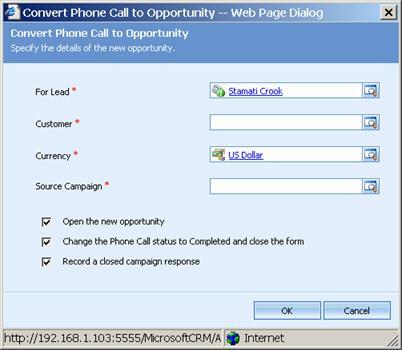 Many activities (not Tasks) can be converted to a case or opportunity with the convert activity button found on the form toolbar and incoming emails can be converted to a new lead. Note: Read-only users will be able to view their activities but not update them. Tasks are the catch-all activity type used to schedule and manage workflow activities and are synchronised with Exchange into the Task List within Outlook. Outgoing email activities can be created manually or from an email template (see the Using CRM section) and replies tracked and stored against the correct entity if you have set up the Email Router for CRM or the synchronisation options for the Outlook Client correctly. Standard emails can be defined with a template and dispatched with the send direct email button or with a quick campaign. The fax activity does not appear to be integrated with the Microsoft fax solutions. Ideally the incoming fax should recognise the telephone number and create a fax activity (with the attached fax document) against the appropriate lead, contact or account. This currently needs to be done manually or programmatically. Phone call records are used for scheduling outbound phone calls and recording notes for inbound calls. Some third party telephony applications automatically create phone call records for inbound calls. · The direction of the call (incoming or outgoing). · The sender or recipient. · Phone or Fax number. 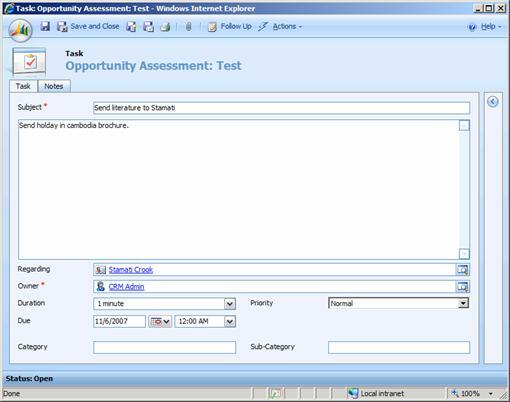 Note: TAPI dialling is possible with the Outlook client but not currently with the web interface for CRM, and incoming call solutions are available from a limited number of telephony vendors (including Cisco and Avaya). The author has a solution for telephony at http://www.redware.com/mscrm. Letter activities can be created manually or as part of the mail merge process when using the Outlook client for mail merge to Word. Documents are not automatically attached and you may like to use mail merge on a single record to create a document and then add the letter activity and attach the document into the notes area using the paperclip on the toolbar. · Lead, Contact or Account. · Equipment and Resources (for example, a meeting room or a projector). 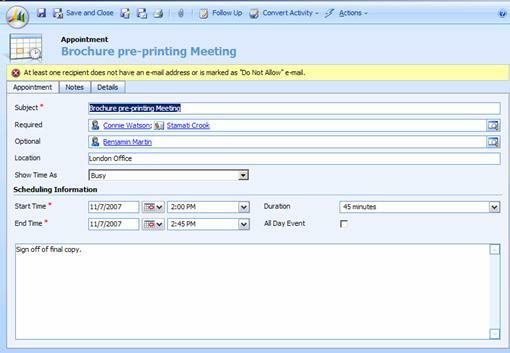 Appointments are recorded in the calendars available from the workplace-calendar and the service-calendar areas and within the Exchange Calendar in Outlook once the activity has been synchronised. Use the save as completed option to clear the appointment from the diary after it has taken place. Service activities are similar to appointments but allow equipment or a package of required resources to be defined and automatically scheduled when available (see the services chapter). Campaign Response activities are used to monitor the success of marketing campaigns (see the marketing chapter).